Season fish filets with salt and pepper and sprinkle with 3 tablespoons flour on all sides. Heat a large pan over medium heat. Add 1 tablespoon butter and oil to pan. Stir to coat. Add fish to pan and cook for 2 minutes on each side or until cooked through and fish flakes when tested with fork. Transfer to a large plate and cover with aluminum foil to keep warm. Add remaining flour and garlic to pan. Cook for 2 minutes or until browned. Add wine and broth, stirring constantly bring to a boil. Cook for 3 minutes or until slightly thickened. Remove from heat and add remaining butter, parsley and lemon. Serve fish with a green salad or rice and top with garlic sauce. You can also this sauce with seafood, such as shrimp. I love pan fried fish because it’s tasty, quick, easy and good for you. Serve it with a savory sauce and you’ve got a winning light dinner your family will thoroughly enjoy. I like to serve my fish, such as salmon, tilapia or Alaskan cod with a buttery garlic sauce. 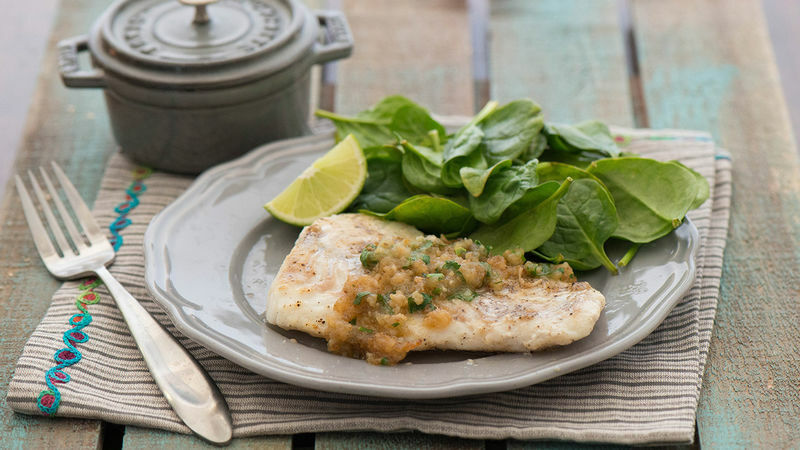 It’s a great way to enhance the flavor of your fish without overpowering it. Serve these fish filets with your favorite green salad or pair it with potatoes, green beans and a slice of baguette. It’s lovely for dinner too.